oh who am I kidding, I keep forgetting to update this list, click HERE to see all the vignette posts, a quick, low commitment and inspiring read! 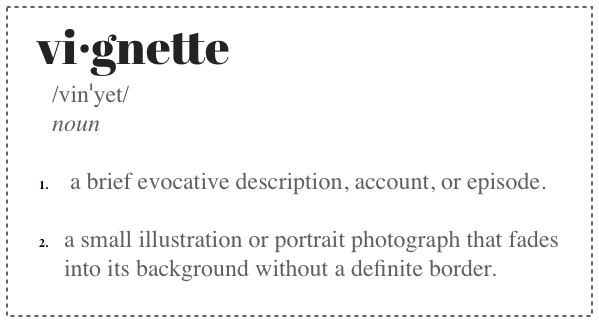 When I say the word vignette (vin-yet) I feel all fancy and French-like. When I try to make a vignette I feel all 12-years-old and dumb. I remember an episode of the Oprah Show where Nate Berkus featured a home that was beautifully decorated, yet approachable. Right when the cameras went through the front door Nate stopped them and pointed out that the homeowner “created a moment” that could be seen and used immediately when anyone walked into her home. 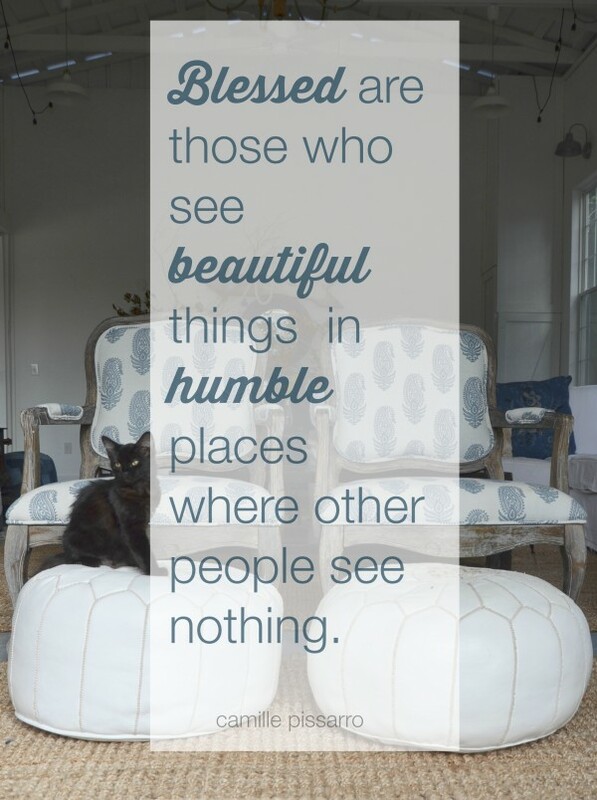 It’s not about showing off meaningless stuff. We create little moments. Small pauses. Little reminders of family, good times, vacations, faith, the simplicity of a few well placed, beautiful and useful items. Our mementoes from life can be put together in a way to inspire beauty and to tell a quick little story–not the entire story, but just a little part… a vignette. Every surface, corner and wall is an opportunity, not an obligation. During this month-long series, I’ll honor your time and mine and do my best to use one inspiring photo and as few words as necessary in hopes that you get up from your computer, take five minutes out of your day and create a beautiful and meaningful vignette in your space. Don’t miss a post, sign up below for quick, encouraging inspiration in your inbox. When you sign up, you’ll have access to The Nest files with free downloads & printables and a how to make tassels ebook. Enjoy! 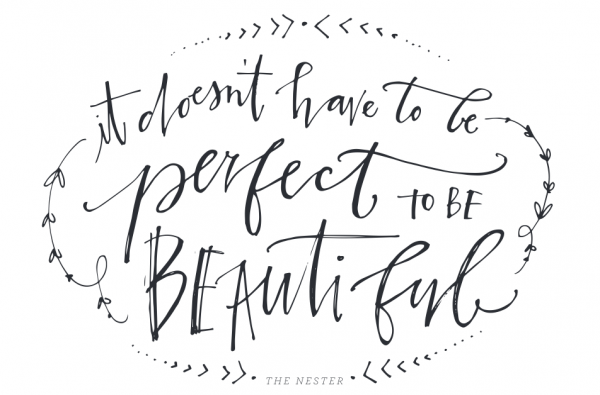 YES, Nester, yes! This will be such a helpful and inspiring topic for us. I’ve just started “vignetting” (yes, it’s now a verb) and taking risks to do so. Really looking forward to this and may have to start a blog just to get in on the action this month! Love, love, love this!! Love! I look forward to this month! My first year with 31 Days! I am so excited about this topic! I love creating vignettes in my home with meaningful pieces and changing them out with the seasons. I am so looking forward to finding inspiration in the ideas you share this month! I love how you said, “Every surface, corner and wall is an opportunity, not an obligation.” I’m going to live that as I straighten, organize, decorate and yes, create vignettes! Looking forward to another marvelous October! Thank you for encouraging us all to write along with you! Love it! 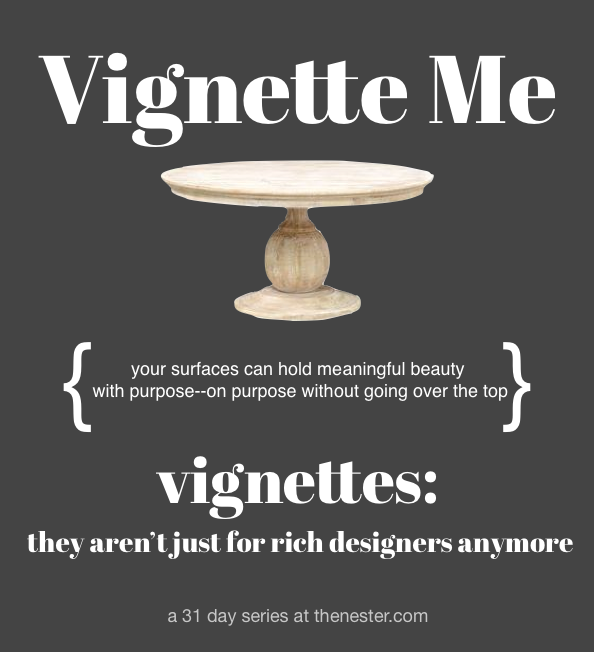 I love me some vignettes!!! ;) Great topic idea! I love this!!! Such a fun series. Our house is for sale and stripped of all the meaningful-to-me photos and mementos that make a house a home. It’s sad. I want my real-life vignettes back! My house is missing all of its moments! So bad at vignettes. I appreciate how you said they should be meaningful and purposeful. I’ve always thought they were more frivolous. And that when I pile junk up next to them like I do on every horizontal surface, they turn into junk. So, I’m listening! I’ve always loved creating vignettes but only fairly recently did I know to call them vignettes. And thank you for clearing up the proper pronunciation although I should have known that since I took two years of French in high school. But that was many, many moons ago. Looking forward to this series! So I saw the preview of your title earlier & knew if reminded me of a song but I couldn’t place it…as I was reading the post I realized it was “Tattoo Me” by Recess Monkey – catchy & can totally be reimagined as vignette me. Makes them sound even more fun! Love these little moments & looking forward to your 31 days! I’m excited about this series, and the opportunity it presents! For many years I loved decorating my home and enjoying making it a retreat for myself, my family, and visitors. It seems that over the years I’ve let that slip. It feels like an overwhelming task on a long to-go list. I have several areas I would love to make enjoyable little moments. I hope this series will break this into do-able chunks for me. Awesome topic! So looking forward. What a fabulous idea. I love displaying with a purpose. Can’t wait to see more. You have such a way with words! I love your topic. Can’t wait to watch it unfold. Thanks so much for hosting…. I’m number 46 on the link up under House & Home…. Love the Home You’re With…and part of that is to make sure our homes tell our story. I’ll be sharing this post as a resource for my readers. 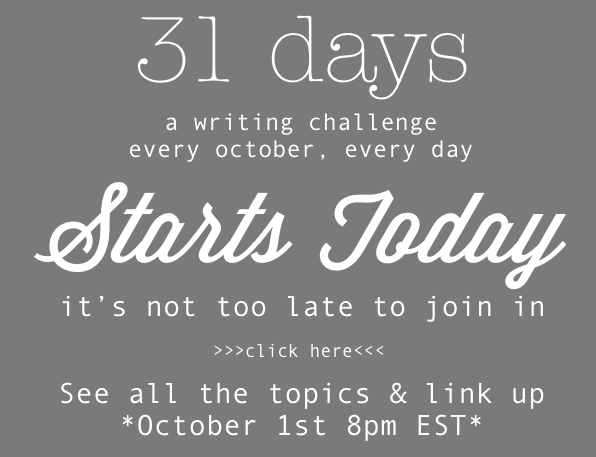 I thought I had entered this challenge of writing 31 days. How is it that I am not able to find the list of topics to write about? Or receive a number like Sharon is mentioning? Is it because I’m on Word Press? Help! 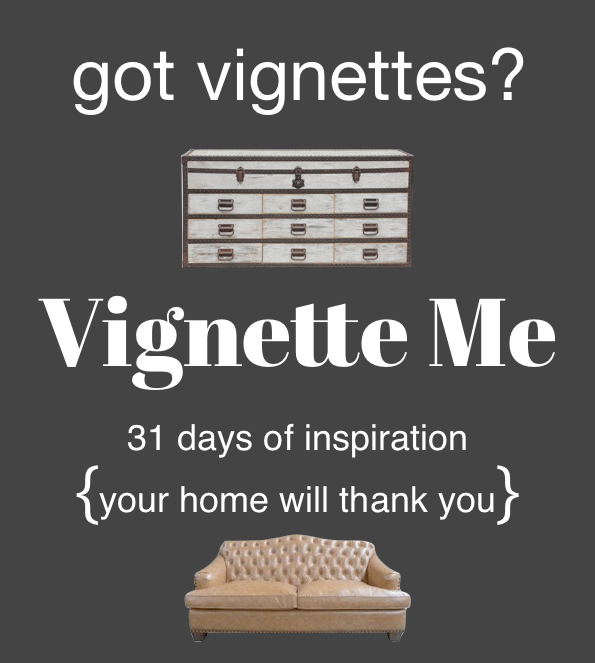 I love vignettes because they are like little memory sections of the home that make it feel pulled together. As usual, looking forward to your posts. Such neat ideas. Are you using an IG hashtag so we could share our vignettes with everyone? Not all of us have blogs on which to share but could on Instagram! This is such a fun idea, and I really should try it with all of our military paraphernalia. We used to have it in a display case, but the case broke, so now it’s all just in a box! I hate to bother you, but I need some help. I have enjoyed reading your 31 days, thanks for organizing this. I would like to read some of the other series, but can’t how to look them up. were comments and questions that people had. I am sure it is right under my nose, but I need help. yes, you were at the right place, my guess is that you had a slow connection, and you scrolled down before the widget could load with all of the links, go back to write31days.com pick a topic and then click and wait 15 seconds and see if the page looks different to you, it takes about 5 seconds for it to load out here in the country for me with my super slow connection, if I look too quickly it looks like it’s not there!